All the GI Joe filecards have a quote at the bottom, either from or about the character in question. But why settle for one simple quote when you could listen to 13 minutes of them. Horror Show is a big fellow and well known fighter from the republic of Georgia. He has plenty of strength and combat skills, but knows he's better off leaving the intelligence analysis to the other members of the Oktober Guard team. Just point him in the direction of whomever you want knocked down or taken out, and Horror Show will get it done with either brute force or lots of explosions. He enjoys being in combat, and is happiest when all that stands between him and making it to the next moment is his ability to be the best fighter in the world. Horror Show grew up in a well-known theater family, and though he acted with them when he was a boy, he never wanted to live or work in a world of illusion. After joining the military, he felt much more at home. Weapons training made him a versatile infantry soldier and a natural choice to be the Oktober Guard heavy weapons specialist, with a penchant for blowing things up with RPG's (Rocket Propelled Grenades). Horror Show is easily one of the most popular Oktober Guardsmen - he's big, he's boisterous... but most of all, he's distinguishable. It's hard to miss a giant man in a quilted jacket and a flight helmet. Rather than reusing the existing Horror-Show sculpt, this figure gets a wonderful new head. Dig that big bushy mustache! This time, Horror Show doesn't get a quilted jacket - primarily because there wasn't one they could reuse in the creation of this figure. The Club got very creative when it came to the jacket, though: despite being made from existing pieces, it looks entirely new. How'd they manage that? 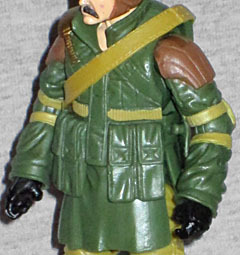 Well, the upper portion of his coat is actually Shadow Tracker's vest, but to give it a better length, they tucked Renegades Cobra Commander's skirt up underneath. Frankly, it's amazing this worked as well as it did. It's very hard to keep the jacket clasped, but since you'll never really be taking it off, it may just be worth gluing the tab shut. The whole thing is topped by a sash borrowed from Snake-Eyes, to help break up the color. The torso under the jacket is Shadow Tracker's as well, but you'll probably never see it. 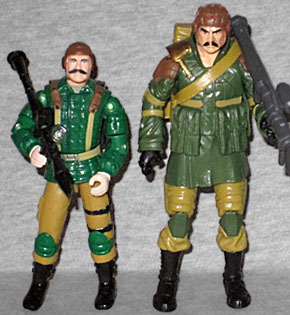 The same figure donated his upper legs, but everything from the knees down come from Reolute Roadblock. That's a weird combo, since Shadow Tracker has those weird lumpy kneepads, and now they get cut off early (to say nothing of the giant hole in the thigh where accessories used to plug in). The arms appear to be new; the shoulder pads are the same ones Skydive had, but these were originally designed for a cancelled movie/POC Arctic Duke. 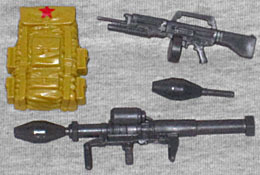 Horror Show comes with a large backpack, an AA-12 shotgun with drum magazine, and an RPG with two grenades and a removable scope (previously seen with the 30th Anniversary Viper). There's a sheath for a knife on the back of the jacket, but none is included with the figure. Like Stormavik, this backpack's peg gets bent to the side by being under the foam tray that holds the figures. Plus, it's hard to line up the hole in the coat and the hole in his back. Horror Show is definitely one of the stars of this set, largely by virtue of being one of the stars of the Oktober Guard as a whole. It helped that he was one of the only ones who looked the same between the comic and the cartoon, and that he was memorable. This is an excellent update, and deserves to be in any Joe fan's collection. We really wish the Oktober Guard could have been one of those BBTS seven-packs, rather than a con exclusive. At least they went back for a second production run when the first sold out, so it won't be a total brutalizing if you want to hunt him down.